A man A plan A canal » Chris Thile & Michael Daves’ Album Out NOW! 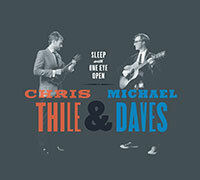 Chris Thile & Michael Daves’ Album Out NOW! Chris Thile & Michael Daves’ Sleep With One Eye Open is hot off the press and gathering momentum like a runaway steam engine. With the considerable hype generated by the release of their 7″ featuring Jack White, the duo has been playing high-profile shows including a recent performance for Paste Magazine and an upcoming WNYC live event. Winning his first Grammy at the age of 16 and appropriately dubbed the “Mandolin God” by Rolling Stone Magazine, Chris Thile shares an undeniable chemistry with Brooklyn-based guitar virtuoso Michael Daves. The accomplished duo’s passion for their craft is evident on every track of their collaborative album, so get up out of your chairs ya’ll, stomp on them floorboards, and hail the arrival of summer with the irresistible stylings of Chris Thile & Michael Daves!